All the recent articles filled with tips on slashing your grocery bill are making me uneasy. I am not opposed to most of the advice. In fact, I agree with it. Yes, we should shop mindfully, cook from scratch, and eschew convenience foods. This is true whether the economy is flush or tanking. Let’s get reacquainted with these practical habits; let’s become better cooks. What bothers me, though, is a certain tone. Underlying the lists of helpful hints, I detect a set of beliefs about food’s relative importance. Or unimportance. One: We are like broken records, forever thinking that food ought to cost less. Are farmers' markets really to be regarded as an occasional indulgence — as I have seen them characterized — when the fruits and vegetables for sale there are among the most nutrient-dense and healthful foods to be found? Two: When the cost of living goes up, one of the first places we look to cut corners is on what we eat, to compromise on what we put into our bodies. When we scale back, I fear that instead of practicing the peasant’s art of turning humble fare into a nice spread, we merely substitute poor-quality ingredients. This is a half-baked effort to eat the way we always have, but for less money. A recent New York Times article on consumer spending profiled American grocery shoppers switching to deli ham at the lowest price point. I hope I never have to shop like that. I want to know more about the meat I consume than its retail price. More to the point, I want to know that it comes from animals that have eaten and lived well. A few weeks ago, I visited John Neumeister’s Cattail Creek ranch in Oregon’s Willamette Valley. The purpose of the field trip was for my co-workers and me to see firsthand how the lamb we feature at our restaurant is raised. Beyond our concerns about the animals’ welfare, we were curious cooks. We wanted to know: What makes Cattail Creek lamb so sweet, its flavor rich but not sharp? What we learned was exactly the kind of information I wish I could get about all the meat I cook. After a 90-minute drive out of Portland on a wet 40-degree day, we poured out of our cars and were led immediately by Neumeister onto an emerald-green riverside pasture that held about 250 of his ewes and lambs. We couldn’t get any closer to the sheep than about 100 yards, so we settled for watching them from afar while we peppered Neumeister with Lamb 101 questions. How old are the lambs at slaughter? About 3 months. Isn’t that younger than the industry standard? Yes, this is when the meat is mild. How do you ensure a year-round supply of lamb? Breed selection, consistent nutrition, and the strategic placement of a teaser ram to bring on heat in the ewes. Neumeister wasn’t going to let us get away without a primer on grass, though. After all, his sheep are completely grass-fed, meaning they eat only grass. Unlike cattle, for example, which are typically raised on grass before being fattened ("finished") on a grain diet in a feedlot, these sheep spend their entire lives dining on pasture. Like cattle, sheep are ruminants. Thanks to their four stomachs, one of which is basically a fermentation vat, ruminants have the unique ability to break down the cellulose in grass, access the plant's protein, and convert it into animal protein. Ruminants don’t do well digesting the soybeans and corn many industrial operations use to fatten their animals. If he has to supplement due to flooding or extreme cold, Neumeister feeds alfalfa to his sheep. As a side benefit, he is unaffected by rising corn prices. “Our formula is rapidly growing young lamb on lush immature grass,” he says. Immature grass? We were about to find out that raising sheep on a diet of 100 percent grass is not as simple as building a fence and turning them loose. Simply put, Neumeister feels that the best way to raise tender young lamb is to put them on tender young grass. 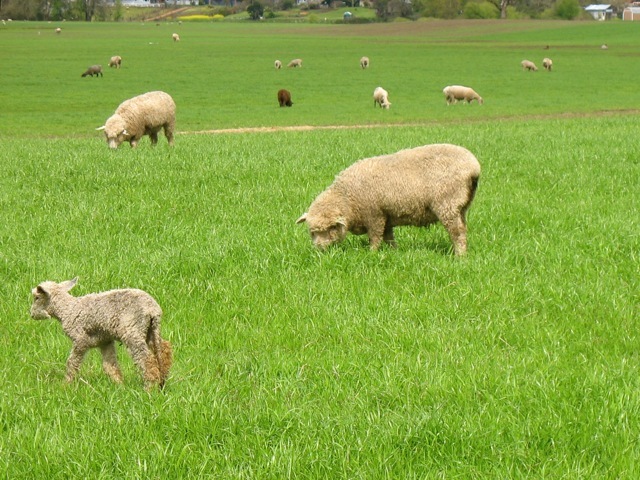 Grasses no higher than 6 inches are the most nutrient-dense, and the most palatable to sheep. Taller, more mature grass puts its energy into growing seeds. “The grass right now has the highest sugar content of the year,” says Neumeister of spring’s ideal growing conditions, including warm weather (except for today) and ample rainfall. “It makes the sweetest meat.” I make my own mental note to feast on lamb in about three months' time. 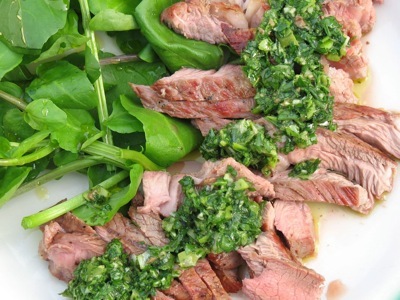 [%image plate float=left width=400 caption="Grilled Lamb Steaks with Green Olive and Scallion Salsa Verde."] This emphasis on nutritious grass has Neumeister masterminding a complex dance of rotational grazing. He and his partner move the sheep onto pastures of fresh grass every two to five days. That’s about how long it takes the ewes (most of them pregnant or lactating) and rapidly growing lambs to mow down the grass. After this, a pasture needs about three weeks to grow back, depending on the time of year. 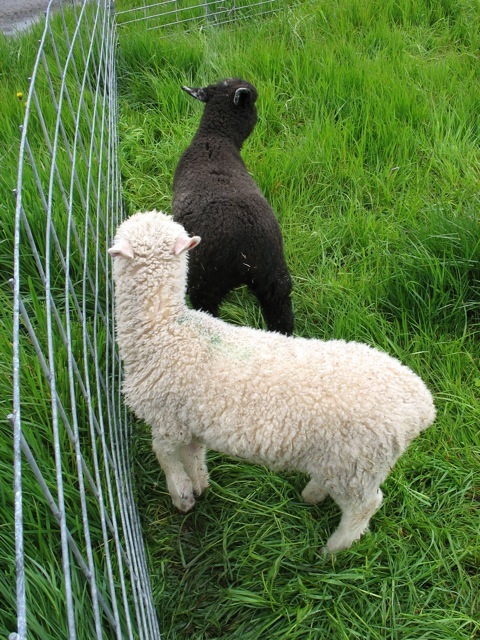 Successive periods of grazing (with the side benefit of the fertilizer the sheep leave behind) force new growth and root reserves in the grass, just as mowing the lawn does. “Scientists have developed devices to measure the biomass available for grazing in the field,” Neumeister says, “but the best information for the farmer comes from getting out of the truck and walking the field.” Which is something he does twice a day. Cattail Creek’s herd has grown to about 1,200 breeding ewes and their lambs. Yet the ratio of sheep to land is kept low, about 2.4 ewes and their lambs per acre. Density of sheep to land, Neumeister notes, correlates strongly to disease. To get that kind of land (he owns only 17 acres), he leases. Leased properties are usually former grass-seed farms. Neumeister overseeds these monocultures with a mixture of tall fescue, perennial rye grass, and white clover. It’s a mixture that he says grows naturally in the Willamette Valley. He likes the mix to be about 50 percent clover. Clover pulls nitrogen from the air and puts it in the soil, providing fertilizer for the grasses. Hmmm, I think, still wondering about the mild-yet-unique flavor of Cattail Creek lamb. Is this what it boils down to, some kind of synthesis between the ruminant animal and the rye, fescue, and clover it grazes, chews twice, then ferments and digests? I’ll probably never find the answer. What I do know is that at the end of our visit, when the sun finally came out, I would have been content looking out at the expanse of grasses and woolly sheep for a very long time. I think that satisfied feeling and the savory lamb meat I enjoy have something to do with what my vegetarian co-worker observed back in Portland, after our visit: Cattail Creek sheep lead about as good a life as you could hope. And that, to me, is worth paying for.